806 pages | 80 B/W Illus. This Handbook offers an up-to-date collection of research on agricultural economics. Drawing together scholarship from experts at the top of their profession and from around the world, this collection provides new insights into the area of agricultural economics. 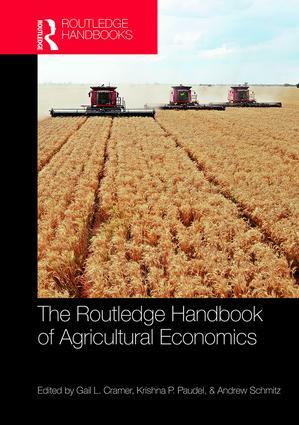 The Routledge Handbook of Agricultural Economics explores a broad variety of topics including welfare economics, econometrics, agribusiness, and consumer economics. This wide range reflects the way in which agricultural economics encompasses a large sector of any economy, and the chapters present both an introduction to the subjects as well as the methodology, statistical background, and operations research techniques needed to solve practical economic problems. In addition, food economics is given a special focus in the Handbook due to the recent emphasis on health and feeding the world population a quality diet. Furthermore, through examining these diverse topics, the authors seek to provide some indication of the direction of research in these areas and where future research endeavors may be productive. Acting as a comprehensive, up-to-date, and definitive work of reference, this Handbook will be of use to researchers, faculty, and graduate students looking to deepen their understanding of agricultural economics, agribusiness, and applied economics, and the interrelationship of those areas. Gail L. Cramer is Professor Emeritus of Agricultural Economics at Louisiana State University (LSU) and LSU Agricultural Center, USA. He has held teaching and research positions for 48 years at Montana State University, University of Arkansas and Louisiana State University. His academic specialty is in agricultural marketing, policy, transportation, and international trade. Krishna P. Paudel is the Gilbert Durbin Endowed Professor of Environmental and Resource Economics at Louisiana State University (LSU) and LSU Agricultural Center, USA. He holds a PhD from the University of Georgia and has been a faculty member at Auburn University and Louisiana State University. Andrew Schmitz is the Ben Hill Griffin, Jr., Eminent Scholar and Professor of Food and Resource Economics, University of Florida; Research Professor, University of California, Berkeley; and Adjunct Professor, University of Saskatchewan.